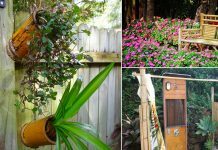 These 5 DIY Old Fish Tank Uses will compel you to get an empty fish tank old or a new one to complete these interesting projects. Before you turn it into any of the following things, you’ll need to give it a thorough clean. If you no longer want to maintain fishes in it, you can use regular household chemicals. Although, if you do want to carry on keeping fishes, or growing food as some of the below examples, use vinegar and hot water to clean the aquarium. 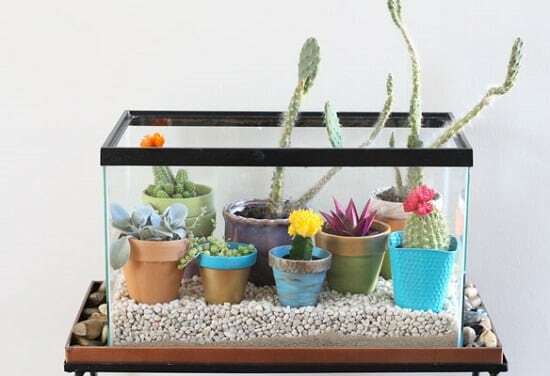 Why not turn your fish tank into a terrarium? 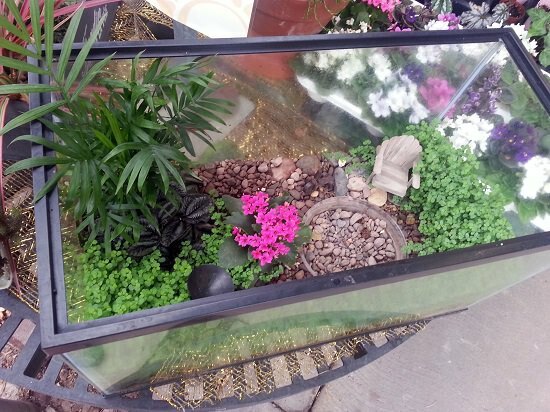 A terrarium is a collection of plants growing in an enclosed container. You can use a variety of plants. The most popular ones to use are succulents. You’ll also need a few different mediums to create the layers in the tank–use soil, rocks, activated charcoal, and small pebbles. Layer the pebbles on the bottom, with a thin layer of activated charcoal on top. This acts as drainage for your plants and helps to fight off bacteria. Then add your potting soil and the plants. Or, directly place the potted plants over the layer of pebbles like the picture above to skip all this. If you have children, this could be a fun project to involve them. 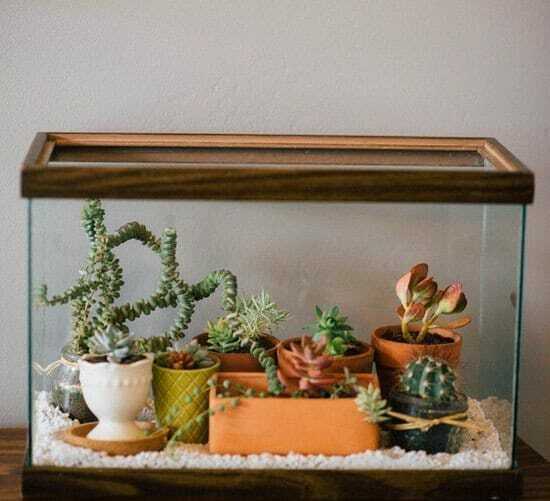 You’ll need to follow the same steps as setting up the terrarium as above, but instead of succulents, use colorful indoor plants or herbs. Take more care when placing the plants and stones, to create a more fairy garden like appearance. Use stones to make a path, add chairs, mini houses as well. Check out more amazing fairy garden ideas here. Whilst this might sound complicated, it really isn’t. 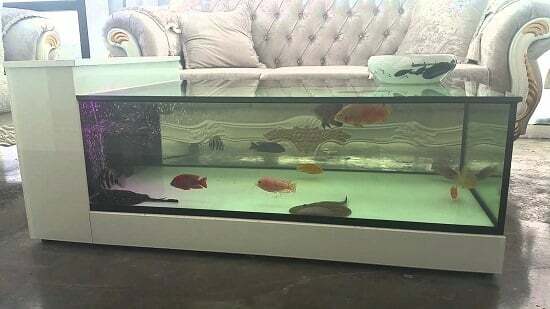 Why not use your old fish tank to make a coffee table for your living room, it will look unique. You can swim fishes in it or add some unique to the tank before you create the table. How about giving it a beach-like appearance using sand, driftwood, and large pebbles? Once you’ve filled the tank up, you’ll need to decide on what you want the top of your table to be. You could have a solid wood top, leave it clear glass, or make a mosaic… the choice is down to you. 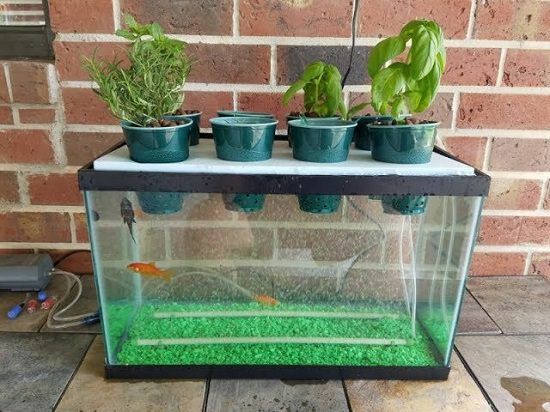 This is perhaps one of the unique fish tank uses, because not only can you actually carry on keeping fish, but you can also grow your own food. An aquaponics set up is a self-sustaining system, in which the fish create food for the plants from their waste, and the plants clean the water for the fish. Once the system is ready, you will spend less time maintaining it than a regular fish tank. They don’t require the same frequency of water changes because the plants are doing all the work. You can grow herbs and greens easily. One of its kind of tutorial video is here for the inspiration. All the last four DIY fish tank ideas have quite practical uses, but this one is for those of you who enjoy being creative. Create a table centerpiece from your old fish tank. 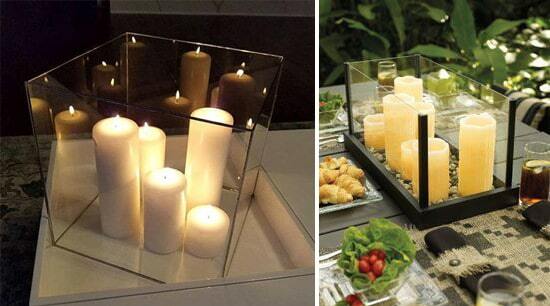 Choose some candles of different sizes to place inside the tank. Place the taller candles along the back wall of the tank, and the shorter ones in the front. Once you have them in place, scatter a layer of small pebbles around them. 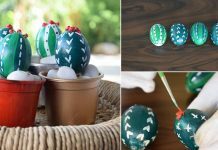 Depending on the season or the celebration you are having, you can add more decorations to your centerpiece. For example, if it’s Christmas, you can add some holly and berries, and if it’s Halloween, you can add some mini pumpkins. Hopefully, these five practical ways to use a fish tank have inspired you enough to upcycle your old fish tank! Don’t miss these eight old fish tank uses in this post. 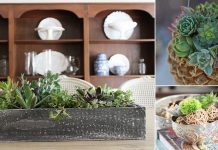 From creating a succulent terrarium to a fish tank side table, there are plenty of out of the box DIY ideas with tutorials.